When you have big mice in your house, you’re certain to attract some big kittie,s too. So they say! Y’all know how madly I fell in love with Kidepo Valley National Park, a protected area in the northeastern corner of Uganda shouldering the mountains of South Sudan and bordered by Kenya to the East. Okay maybe you didn’t know, but now you do. Often referred to as “The True African Wilderness,, it’s always been the cool wild vibe, that raw and true feeling of the African bush and the thought that “surprises are ceaseless in this part of the world.” Oh and should you experience a magical wildlife sighting, it will just be you and the wilderness. This park is free of the typical safari jeep traffic in most African national parks. 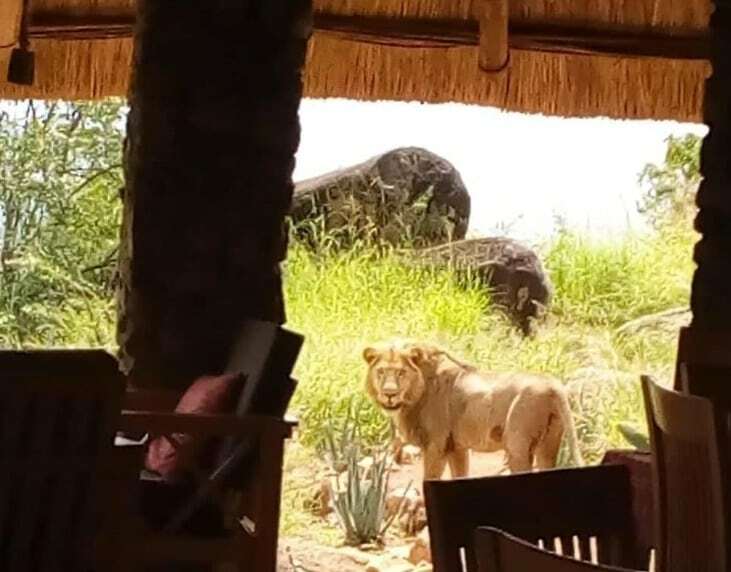 Well on Thursday (July 26, 2018) around lunch time, one of the lodges in the park was surprised unusually by a kingly visit from one of the park’s graceful felines, a lion. He walked right into the cafeteria (restaurant area) took his seat around the dinner table and patiently looked out for the waiters to serve him. Maybe all he needed was some marinated steak and a chilled African juice to quench his thirst. But after waiting a while with no service, off he went perhaps to forage or to find a restaurant with his kind of menu. From my chat with Justus Ainomugisha, the manager at Kidepo Savanna Lodge bordering the national park, who also filmed this royal wild patrol, I established that this was a very rare visit and the guys at the lodge couldn’t explain the feeling of both fear and excitement. Kidepo Savanna Lodge is owned and managed by Nature Lodges a chain of safari lodges in Uganda. “Around midday while our guests were out on a morning game drive, I and my staff witnessed a visit by the graceful king of the jungle. We heard something scratching inside the restaurant, but we first didn’t take it seriously as we thought it was just a waterbuck. But on looking closer we saw the lion chilling under our restaurant table. He walked right in for a short while (about 30 minutes) and then left shortly after without causing any chaos when we began taking photos,” Justus mentioned. He also mentioned that it is very common to hear the lions roaring and fighting in the night, and it is a usual delight for their guests. Diederik informed me that “this lion seems to be one of the two brothers that fight a lot and the loser must have found his retreat at their lodge.” He passionately added that for someone looking out to see the real African bush, smell it, hear it – immerse in it, they just must visit Kidepo. Kidepo is everything! She presents countless species of wildlife in a park unpopulated by safari vans. Lions, leopards, cheetahs, elephants, giraffes, buffalo, ostriches and many other bird species, antelopes, name it; and then there’s the stunning landscape guarded by authentic local communities with fascinating cultures. The truth is this park is wild, so you must be on your guard and very careful not to wander off alone, but the park management deploys armed rangers all around the park to ensure that tourists are safe and get the very best experience here. I love this place and highly recommend it. For now I remain yours truly, The Ugandan Tourist. Newer PostFirst thing visitors to Jakarta notice? Traffic!